Have you ever questioned where in the world do we live, and what lies beyond the visible world? These have been intriguing questions for humans since 5000 years ago, for which our ancestors actively sought answers and went on expeditions into deep space, just to answer the existential question: where’s our place in the Universe? 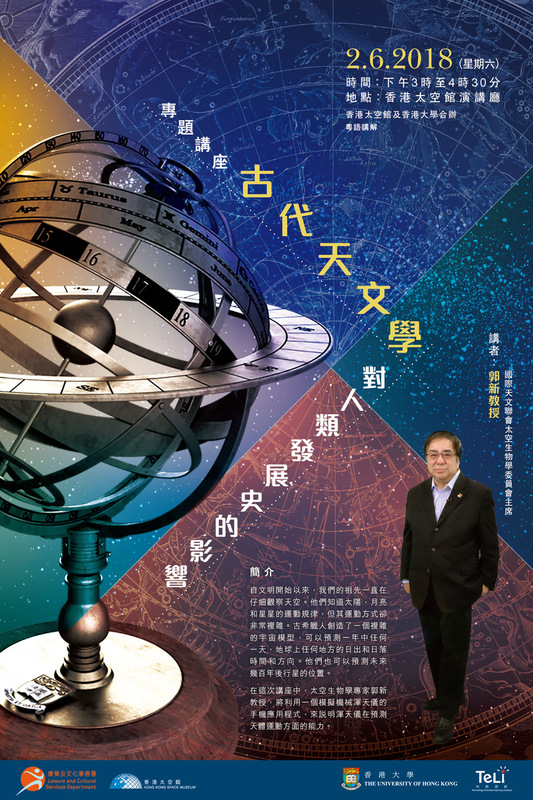 On June 2, 2018, Professor Sun Kwok held a public lecture in the Hong Kong Space Museum’s Lecture Theatre, attracting a crowd of over a hundred. Students, professionals, families and astronomy enthusiasts flocked to listen to Professor Kwok speak about how man made sense of our surrounding environment, and the development of a scientific mind throughout this process. Professor Kwok illustrated how our ancestors’ practical needs of planning for agriculture prompted them to closely observe the environment, turning their attention to the skies to examine how stars moved. From observations, humans began to imagine, hypothesize and correlate phenomena, eventually coming up with theories to explain how the celestial sky works. Slight discrepancies of actual observations with proposed theories sent them thinking further, resulting in more accurate explanations of the nature being born, and in the long course of history, the development of the scientific way of thinking and rational mind. Man deconstructed and constructed knowledge and built up a legacy of what we have today – a chest full of rich astronomical understanding to our disposal. Understanding how we have come this far is equally important as knowing what our current comprehension of the Universe is. Towards the end of the lecture, Professor Kwok engaged in a lively exchange of questions and answers with the audience, where visitors raised curious questions about specific details of the talk. Furthermore, visitors had an enjoyable time trying out the Armillary sphere app, co-developed by HKU TELI and Professor Kwok. With the aid of animated instructional videos and the guidance of TELI’s staff, visitors learnt how to operate this digitized ancient instrument. The app is powerful enough to predict the Sun’s motion on any given altitude, and some visitors even tried to work out the sunrise and sunset times on their birthdays! Many also took the opportunity to learn about the upcoming free MOOC course Our Place in the Universe, launching on June 12, 2018 on EdX. If you missed the public lecture, here is your chance to embark on a journey with us through the stars and into history!